Tinsley recently was selected to attend a tasting event at Chick-Fil-A. She was part of an exclusive panel to help select their new summer salads (and was even interviewed to be in a commercial). One Tinsley’s favorite salads from the tasting was their Market Fresh Salad – filled with the flavors of summer. That inspired us to make a salad filled with our favorite farmer’s market flavors. 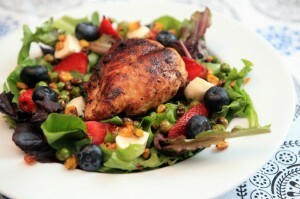 We include fresh strawberries, blueberries, peas and corn, and then topped it with juicy, organic chicken. If you’re looking for a show stopper salad, this one fits the bill! To a small prep bowl, add coriander, red pepper and a good pinch of salt and pepper. 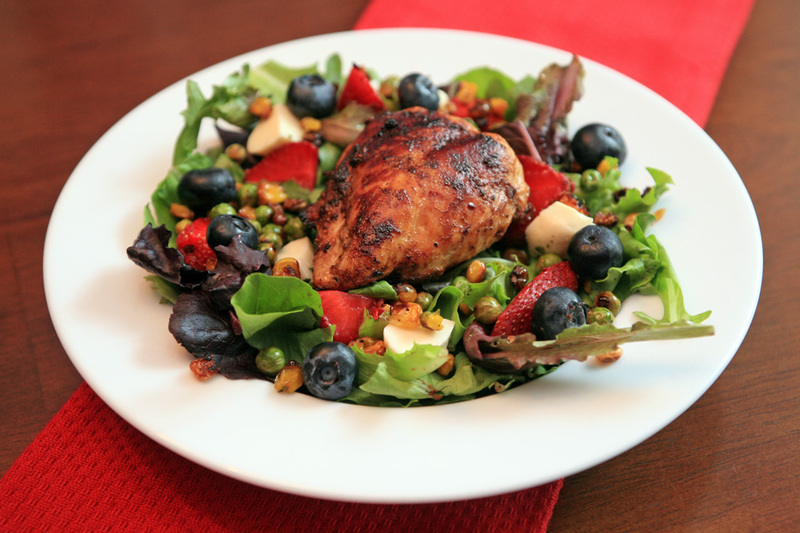 Drizzle honey over both chicken breasts and liberally season both sides with herb mixture. Place a skillet over medium heat with a drizzle of olive oil. Add your chicken to the pan. Allow to cook for about 5-6 minutes. Flip the chicken. Continue to cook until the chicken reaches an internal temp of 165. Remove from heat and allow to rest. Preheat oven to 350. Add corn and peas to a small prep bowl. Season with a drizzle of olive oil, salt and pepper. Spread veggies onto a baking sheet and roast for 10 minutes, tossing veggies once. Remove once the corn has color and the peas are slightly crispy. Allow to cool. Add greens to a serving bowl and arrange veggies, fruit, chicken and cheese on top. In a medium bowl, whisk together the honey and lemon juice. Whisk in the oil in a slow stream, until the dressing becomes thick. Season with salt and pepper and drizzle down over the salad. How perfect!!! Just in time for 4th of July!!!! So pretty!